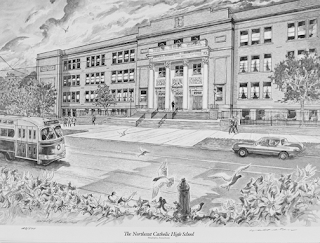 It's coming up on 5 years since The Northeast Catholic High School For Boys closed it's doors. As such, we thought it would be appropriate to include a post from the now defunct Falcon's Nest Blog from 2010, which was written by Mike Ferris '82 and Tom Crossett '75. This is being reposted here with their permission, as well as the permission of the entire former staff at The Falcon's Nest. Note: Although the basis for this article is true, some of the predictions about the future may not have played out exactly how it was speculated back in 2010. A funny thing happened on the way to transitioning North Catholic into a Cristo Rey network school. You see, the feasibility study was going along just fine. The archdiocese’s Office of Catholic Education (OCE) had orally given its blessing (remember this! ), businesses were lined up, the alumni association was backing the plan, an existing student base was in place, money was being raised, and many people were on board for this new venture. The only two things that needed to be done were to secure a building, and have a religious order take “ownership” of the building and school. The former is a requirement of any school, but the latter is a requirement of the Cristo Rey board. While Cristo Rey is a Jesuit application, the Jesuits were open to any order to lend a hand. The final pieces to this puzzle seemed like slam dunks, right? Not so fast. The Oblates of St Francis DeSales were no stranger to running schools. After all, the Oblates run schools all over the world, and a few in the Delaware Valley, including North Catholic, Father Judge, Salesianum (DE) and DeSales University (Allentown). They took responsibility for North Catholic in 1926, when the school first opened, and have run the school for the past 84 school years. One might argue they stopped running the school in the 1990s, especially when the current President took command. But, the Oblates were not interested in taking ownership of the new private North Catholic as a Cristo Rey Network school, in September, 2010. Why would they apparently abandon the school that they helped create and foster for all of these years? I certainly don’t know, but many of my alumni brothers have their own ideas as to the why. I’ll get into that later. As for the building, many in the North Catholic Community had a desire to keep the existing building. This, along with the existing enrollment of underclassmen, would allow for the continuity between the old and the new that many people had hoped for in this venture. There were three options to secure a building. The first, and most desirable option, would be to purchase (or lease) the building from the archdiocese. This would be the easiest path to opening in 2010. The other two options would be to buy an existing building and retrofit it for use as a high school, or build a new school, which would require a lot of time to secure a property, design and build a new school. So, with the deadlines approaching quickly, some well-healed NC alumni made arrangements with a National Bank to personally secure a loan based for the fair market value of the building. That fair market value was estimated to be between $1.5 – $2.0 million. In addition, in what the planning team called “an emerging donor base of Non-NC professionals”, this group would “provide capital to renovate the property, including Science and IT labs (approximately $5,000,000).” The Feasibility Committee submitted their bid to the Archdiocese and its plan. To date, the planning team is still waiting to get a response from the Archdiocese. As Paul Harvey used to say, “Now, for the rest of the story……” The official line of the planning team was that there just wasn’t enough time to open North in September, 2010. That’s not entirely true. You see, as I outlined above, nearly everything was in place for a September opening. The only pieces to this puzzle that were missing were a religious order stepping up to run the school, and a building for the school itself. In a Daily News column, by Ronnie Polaneczky, on March 19th, Jason Marquess, who heads the “Friends of Northeast Catholic High School” (FONECHS), stated, “We even offered to buy the building, right now,” for between $2.5 and $3 million. Marquess went on to state that the Archdiocese, “…told us no.” When another NC alum (who is well informed, but has asked not to be named in this article) forwarded this column to Bishop McFadden, the Bishop’s response, in a letter to this alum was, “At no time did the Alumni offer 3 million for the building that was rejected.” Technically, the Bishop was correct. As I wrote above, the group offered a personally secured loan for between $1.5 and $2 million, plus an additional $5 in capital improvements to the building. So, technically, the Bishop was not lying here, at least not literally. In Catholic terms, you might consider this a “venial sin.” The total offer was more than $6 million and as much as $7.5 million, and it was never actually rejected. It was just ignored. Speaking of the letter to my good friend and alumni brother, it was also stated by the Bishop, “While it is true the alumni have covered the deficit for the past few years, they were the ones who sought relief from this burden.” Wow! This is a shocker to me! Ever since 2003, when the OCE began demanding debt payments from individual schools, North Catholic, with the help of the Alumni Association, FONECHS and other generous supporters, has met it’s financial obligations each and EVERY year. From what I’m told, at no time has any of the above ever asked for “relief” from that obligation. Now, this may be just a little fib on the Bishop’s part (or the “mortal sin”), or to give him the benefit of the doubt, maybe he was given bad information. I’ll let you decide. In my travels, I talk to many North Catholic alumni and friends of North Catholic. It seems as though the consensus regarding the Oblates refusal to take ownership of the school in 2010 is motivated by this organization’s desire to stand by their motto and “take hold and not let go.” You see, with over 500 young men at both North and Cardinal Dougherty, all of whom will be looking for a new school to complete their high school education, the Oblates seemed to be more focused on ensuring that as many of those students transfer to Father Judge (the other Oblate school in Philadelphia) rather than making an attempt to transition North to a private school. The North Catholic that we all know and love is closing in June, 2010. That’s a fact. Father Judge, which the Oblates want to hold on to, will remain open. The thinking is that they want to hold on to what they still have (Judge) instead of taking a “gamble” on a new private school. What do I think? Well, I don’t know. I haven’t been around the school much over the past few months, but many who have been have told me that the words “Cristo Rey” have not been spoken much, if at all, by any of the Oblates currently running the school. Instead, it’s been a rush to convince students and their families to transfer to Judge. Are they just bag men for the Archdiocese? Again, you decide. So there you have it, the story all the clerics are afraid to relay to the public. Why, you might ask? Well, I think while each group is different from another, there is a “union mentality” to it. By this I mean, it doesn’t matter that each of our competencies are different, we would never cross the picket line and embarrass their brothers. In this case however, there were over 500 children and families at risk that none of these groups really cared what happened. How can anyone not realize that the Catholic church of Philadelphia, the Oblates and now the Jesuits deserted areas of this city where Catholicism is still strong, can be nurtured and grown. White flight, Catholic chasing on the part of Archdiocese, Order survival on the part of the Oblates, and finally, acquiescing so feelings of their cleric brothers would not be embarrassed by the Jesuits was the final straw. Religion, as I was taught, is predicated on faith and most importantly on hope. Great example these three groups set here. It would not be fair if we did not put the names with the culprits, and they are as follows. First on the list is Father Vincent Smith, OSFS. Father Smith’s legacy will be defined as the Oblate who caused the death and closure of North Catholic. He is the main character in this many act play. His co-star is none other than Bishop Joseph McFadden. He came riding in on his high horse to help save Catholic education in the Archdiocese, but alas, what you see is just cowardly acts of closing parishes, elementary schools and now high schools. There is something else at work here, just a plain hatred of North. But, I can’t put my finger on just why. Maybe it’s because he never won a Catholic League championship as a basketball coach, even with Michael Brooks on this team. Do I think this was a conspiracy, I doubt it. To have this type of conspiracy, you need to be smart, clever and duplicitous. They have the final two traits; I can’t give them the first however. Was there a silent agreement, sort of an understanding between them all? I don’t think there is any question about that. So, there you have it. You now know the real reason why North Catholic will not be open in September, 2010. Where do we go from here? Well, the Oblates, along with the Archdiocese, have taken over the feasibility study for the new North Catholic, as a Cristo Rey Network School. The plan is to continue the work that was started by the first planning team, and have a school open by September, 2011, and graduate their first class in June, 2015. Some insist that is not a real effort by those groups, but rather a public relations ploy to show that both groups really do care about the community around North Catholic. Some have suggested that in the next year or so, the OCE will give West Catholic, the next school on the chopping block, a two year window so they can explore the possibility of opening the first Cristo Rey School in West Philadelphia. With West’s student body consisting of nearly 90% non-catholics, compared to North’s (less than 10% non-catholic), it would make one wonder why the archdiocese would give up on their own faithful in favor of families who will most likely never contribute to the success of the catholic faith in Philadelphia. But, what do I know? We’ll just have to wait and see how things play out. As for me, well, I’ve wrestled with what I should do regarding North Catholic, and more importantly, the good folks who make up the North Catholic community. I have come to this conclusion. I’m a North guy. I was raised by a good family, and educated by the good Sisters of St Joseph and the Oblates of St Francis DeSales. Even if a New North Catholic is opened in 2011, and there is absolutely no continuity between the old North and the new North, this is still my community. I choose to live in the same zip code as North, even though I have the means to do like many others and move out. I love where I live and I care about the people in my community. If a real effort is made to provide catholic education in my neighborhood, to fill the void of the closing of North Catholic, I’ll be there to help in any way that I can. Am I still upset by what has happened over the past several months? You betcha! But, I’m still a product of my environment, and I would be a fraud if I turned my back now. I urge you, my NC brothers, to do the same and offer any help that you can to help the people in the neighborhoods where you were raised. It’s who we are. We Are, and always will be, NC!